Software on desktop, server and cloud systems today represents a major part of business assets. Software in embedded devices, however, is typically sold as a “free” part of the device hardware. One reason for this approach is that such devices are not Internet-connected – licensing and modern software payment methods like subscription, feature-on-demand or pay-per-use are difficult to realize. This will change with the IoT wave – when all embedded devices are finally connected to the Internet. The challenge ahead is that in a typical industrial system many thousands of such embedded devices will be installed from many different manufacturers. Using an individual payment method for the software on each device (e.g. based on credit card and serial numbers (tickets) as with today’s desktop software) would be extremely cumbersome. 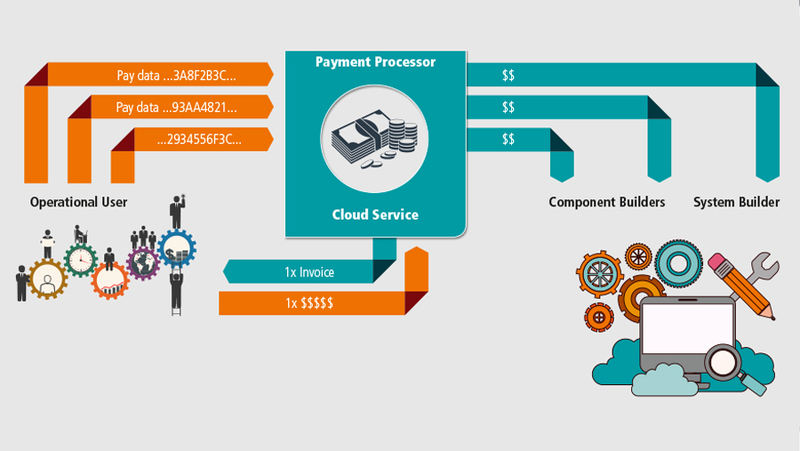 Instead, a technical standard, which automatically manages the payment of all used devices at the Operational User site by a centralized cloud-based Payment Processor (as shown in figure 1), would be useful. Much like a credit card clearance service, this Processor collects the money one time per payment cycle (e.g. one month) from the Operational User and distributes it in accordance with the agreed upon price to all the manufacturers of the devices (generalized as Component Builders) and the System Builder (as its share for planning and deploying the complete system). Wibu-Systems discussed this idea last year with other companies involved with the international Industrial Internet Consortium. They liked the idea, but quickly viewed the monetization aspect in a much broader spectrum, as there are many more monetization methods possible than this one example. 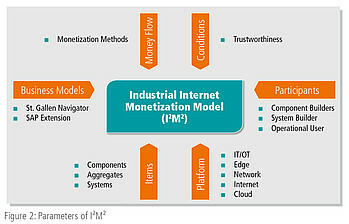 To describe such methods site by site, the Industrial Internet Monetization Model (I²M²) was created. Figure 2 illustrates all of the parameters of the model. Systems and Components have already been described in figure 1. Aggregates are components of components (of any depth) which can lead to complex monetization scenarios. Platform describes industrial location parameters – monetization in the cloud is probably different from at the „edge“, where permanent Internet connections are not always possible or not even desired. Conditions influence Monetization Methods as well – a safety component for example must also work even if its subscription was not payed. Participants are the different actors in an industrial system. Figure 3 explains their relationship: An Operational User wants a new industrial system (e.g. an oil rig). 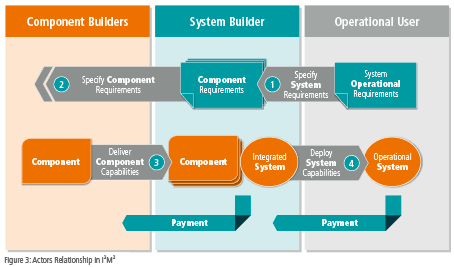 The System Builder converts the requirements into a real system, adding many components together. The system is finally deployed and the Operational User operates it. Figure 3 shows two traditional payment arrows: The Operational User pays the System Builder upfront one time and the latter pays the Component Builders one time. Physical Costs: Required to build the component from raw material or other components. Intellectual Costs: Software development, patents, cloud services and intellectual properties like pictures. Setup Costs: Required to install, test and validate the system. Profit: The component builder‘s reward for business success. The Dynamic Monetization Method defines Physical and Setup Costs as Upfront Costs and Intellectual Costs and Profit as Usage Costs. Upfront Costs are traditionally paid before the system is deployed while the Usage Costs are paid when the system is operated and creates revenue for the Operational User. This article is only an introduction in the complex but also exciting world of Industrial Internet Monetization. Using I²M² as a model for different Monetization Methods helps to establish such methods in the future. 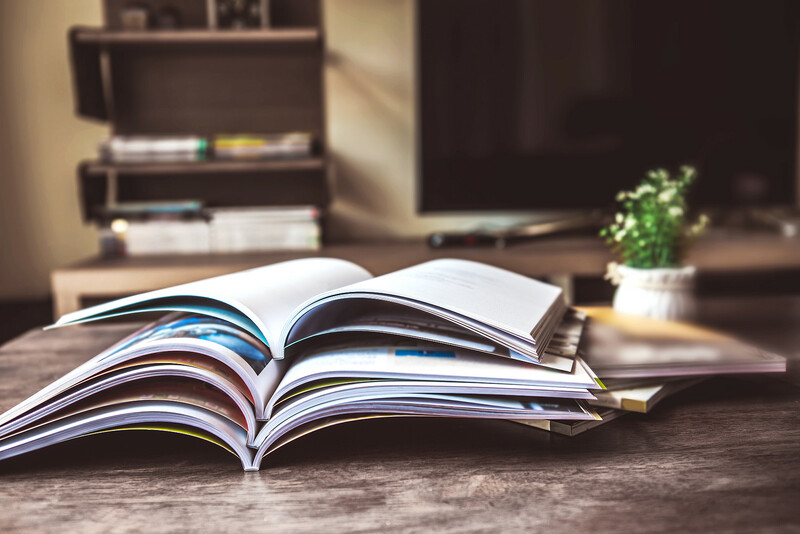 The different scenarios can illustrate how they might fit within a world of varying business models, components and systems and the relationships with different participants like Operational User, Component and System Builders. One of the promising Monetization Methods is Dynamic Monetization. It moves significantly the payment of Industrial Systems from upfront to the time of usage. This method faces challenges from markets and participants, but they all can be solved with a sophisticated standard and the advantages of Dynamic Monetization will redefine how industrial systems will be paid in future. At IIC only the Business Viewpoint of I²M² has been described to date. After all of the business requirements have been discussed, IIC will move into an Implementation Viewpoint, which describes all communication standards necessary to implement the model shown in figure 1. Once all this information is collected, it will be possible to define a plug-and-play standard, which will finally automate the Dynamic Monetization as much as possible, so that picture will become reality.